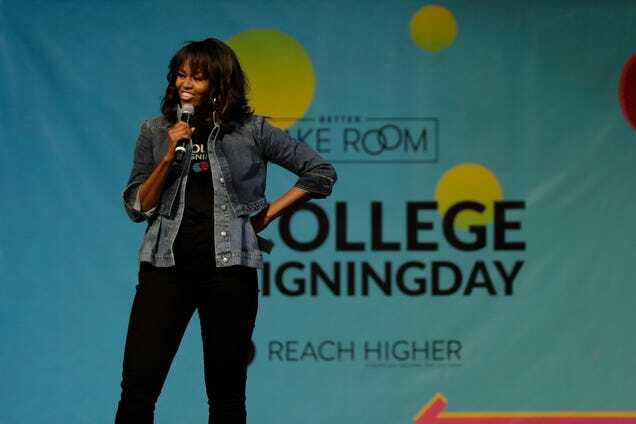 Michelle Obama speaks at College Signing Day, an event honoring Philadelphia students for their pursuit of a college education or a career in the military, on May 2, 2018, at Temple University in Philadelphia. During a stirring speech delivered to rising college students in Philadelphia on Wednesday, Michelle Obama embraced the moniker “Forever First Lady,” sending the crowd of 8,000 high school students into thunderous cheers. At the 2018 College Signing Day at Temple University, HuffPost reports, Obama delivered a message of encouragement to the high schoolers, telling them: “I know you have everything it takes to succeed. I know that you are me. The signing-day event began during the Obama administration as part of the first lady’s Reach Higher program, an initiative that encourages America’s students to achieve a college education. Michelle Obama has been referred to as our forever FLOTUS across the internets since leaving the White House last year. Now that Obama herself has (lightheartedly) referred to herself as such, it’s official. Accept no imposters. The only first lady we recognize is our forever-ever one.